JULIA Gillard is a "hipster" glasses wearing redhead who's constantly being questioned by concerned Australian citizens. She's also a professional photographer who lives in Brooklyn, New York. In a case of mistaken identity that's lasted since Prime Minister Gillard was sworn in in June 2010, Ms Gillard, 35, has received a constant flow of emails from confused Aussies stumbling across her website, www.juliagillard.com. "I'm not sick of them, I think they are so funny, I kind of love getting them,'' she said. "The 'real' Julia Gillard just got more confusing", Daily Telegraph, February 18, 2013. 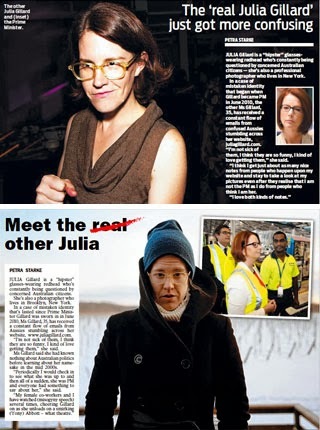 "Meet the real other Julia", The Advertiser, February 18, 2013.